The high altar does not stand alone like the front altar. Most noticeably, it has what is known as the reredos. 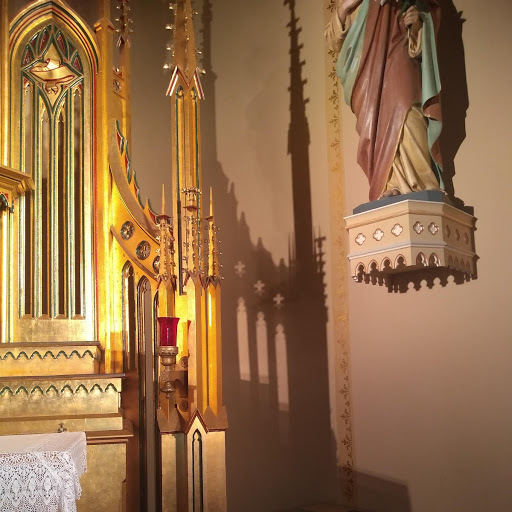 They are decorations that extend from the back of the altar to help focus on the sacrifice on the altar, the same sacrifice that lives in the tabernacle. Ours here at St Joseph is very rich in symbolism and teaching moments, more than in most I find. Categories: Bulletin Articles, Catholic Church, Catholic Life, community, Explanations of the Faith, From the Pastor, Reflections | Tags: altar, beauty, Church Building, Freeport IL, St Joseph Church, symbolism | Permalink.